We hand make an item called the Garden Cafe. The bird feeder is built out of cedar in our workshop. 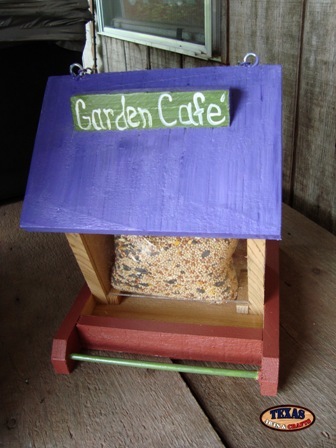 The roof of the bird feeder is hand painted purple. 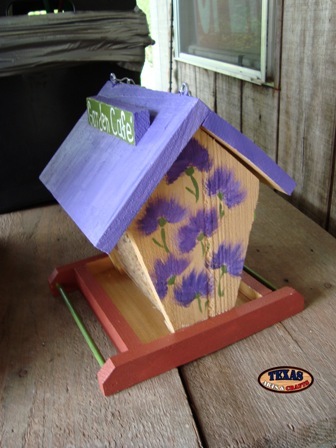 Purple flowers are painted onto the sides of the bird feeder. The size and colors may vary slightly as it is hand crafted. Some of the birds that will be attracted to the bird feeder are the American Kestrel, the Great Crested Flycatcher, Wrens, Chickadees, Nuthatches, Titmice, Swallows, Blue birds, Mockingbirds, and Woodpeckers. For more information about these birds go to Backyard Birds, Blue Birds, and Purple Martin Birds. 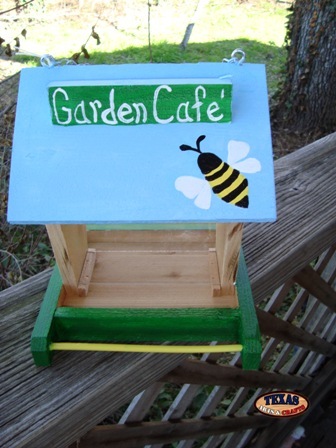 We hand make an item called the Garden Cafe With Bumble Bee. The bird feeder is built out of cedar in our workshop. 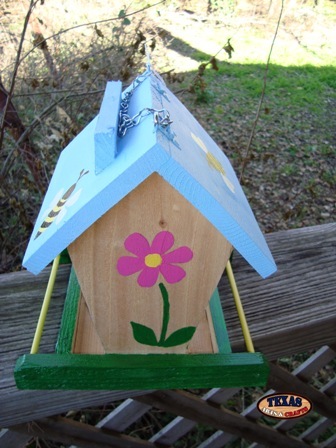 The roof of the bird feeder is hand painted light blue with a black and yellow bumble bee. A pink flower is painted onto the sides of the bird feeder. The size and colors may vary slightly as it is hand crafted. Some of the birds that will be attracted to the bird feeder are the American Kestrel, the Great Crested Flycatcher, Wrens, Chickadees, Nuthatches, Titmice, Swallows, Blue birds, Mockingbirds, and Woodpeckers. For more information about these birds go to Backyard Birds, Blue Birds, and Purple Martin Birds. We hand make an item called the Garden Cafe With Dragonfly. The bird feeder is built out of cedar in our workshop. 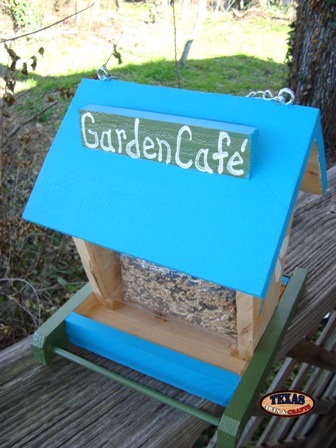 The roof of the bird feeder is hand painted light blue. 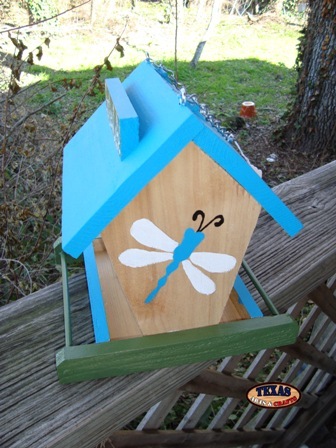 A blue dragonfly is painted onto the sides of the bird feeder. The size and colors may vary slightly as it is hand crafted. Some of the birds that will be attracted to the bird feeder are the American Kestrel, the Great Crested Flycatcher, Wrens, Chickadees, Nuthatches, Titmice, Swallows, Blue birds, Mockingbirds, and Woodpeckers. For more information about these birds go to Backyard Birds, Blue Birds, and Purple Martin Birds.